Following a time-honoured tradition,golden Bonbon's Nougat is still handmade and contains only the freshest ingredients. Toasted almonds which form up to half of the product’s weight, are combined with honey, sugar, corn syrup and egg whites at high temperatures in traditional confectioner’s copper bowls. 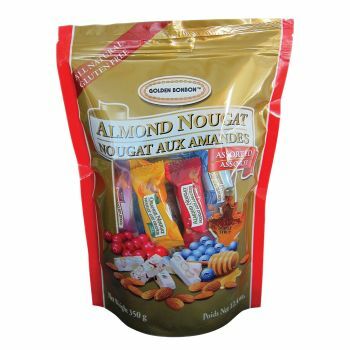 This bag contains many ofgolden Bonbon's best-selling flavours.golden Bonbon Almond Nougat is a natural product, that is cholesterol-free,gluten free, trans fat free, Kosher and Halal designated.